The Door County Land Trust was formed in 1986 to accomplish a single mission: to protect Door County’s exceptional lands and waters…forever. The Door County Land Trust accomplishes its mission by entering into conservation easement agreements with private property owners, accepting donations of property, and by purchasing land. The Door County Land Trust’s expertise and years of experience in working with property owners and families in Door County is making a significant difference. Hundreds of acres of farms, orchards, fields, forest, wetlands, and shoreline are now permanently protected thanks to the partnership forged between the Door County Land Trust and more than 50 landowners. From Washington Island to Southern Door, the Door County Land Trust is leaving a legacy of protected lands to future generations. 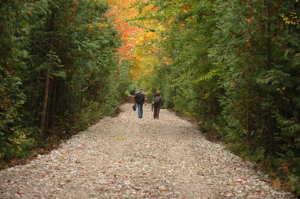 As a Door County property owner, you know that your land is special. Whether farm or forest, wetland or meadow, lakeshore or bluff, the lands that grace Door County are like no other. The reality is that unless positive action is taken to protect land, your piece of Door County paradise may be lost to future, inappropriate development and subdivision. But there’s good news: Landowners have it within their power to protect forever the conservation and scenic values of the lands they love. What Door County will look like a generation from now is being decided day-by-day, parcel-by-parcel, by landowners like you. Since 1986, the Door County Land Trust has helped hundreds of landowners throughout the county protect their properties and would be honored to assist you and your family in planning for your land’s future. We listen to landowners’ goals and vision for their land and help match these with the most appropriate land protection strategy. We write conservation easement agreements or facilitate land donations that protect the property’s conservation and scenic values while accommodating the needs of the landowner. We conduct biological inventories for landowners to identify and document the variety of plants and animals present on their land. Through our membership program we provide the financial resources needed to offer land protection assistance to landowners. We are stewards of the conservation easement agreements and lands we accept and have the perpetual responsibility of protecting the scenic, rural, and ecological values of these properties. Arriving at the land protection strategy that is right for your particular situation takes thought and deliberation. The Door County Land Trust has the concern, experience, expertise, and commitment to provide landowners with sound information and assurance of long-term protection for their property. We are here, ready to help. Conservation easement agreements donated to the Door County Land Trust have helped dozens of Door County property owners protect over 3,200 acres of land throughout the County. The types of properties protected include farms, forested properties and those that contain wetlands, streams or lakeshore. As development pressures continue to increase, and as more landowners realize that they have the ability to permanently protect the lands they love, conservation easements allow landowners to achieve their conservation vision. When owning land, a person also “owns” many rights associated with land ownership, such as the right to build residences and buildings, place structures such as billboards and communication towers, subdivide the land, clear the forest, and so on, subject to local zoning ordinances. A property owner that enters into a conservation easement with the Door County Land Trust permanently restricts some of these activities in order to protect the scenic and conservation values of the land. Conservation easements permanently protect land while leaving the property in private ownership. Landowners can continue to live on the land, are free to sell their land or pass it on to heirs, and can use the property in any manner as long as the terms of the conservation easement are adhered to. Conservation Easements are legal agreements between the property owner and the Door County Land Trust. These agreements permanently restrict the type and amount of future development and activities permitted on a property in order to protect the land’s scenic and conservation values. By providing a “framework” for how the land can be used in the future, conservation easements can reduce the potential for disagreement when lands are passed on to heirs. Because every property is different, as are the needs of every property owner, no two conservation easements are alike. The easements are written to meet the needs and desires of the individual landowner while protecting the scenic and ecological integrity of the property. The specific activities the conservation easement prohibits are mutually determined by the landowner and the Door County Land Trust. The donation of a conservation easement to the Door County Land Trust can qualify as a tax-deductible charitable gift. A conservation easement can also be donated by will. Land donations to the Door County Land Trust are one way for landowners to permanently protect their land. Donating land is one of the greatest legacies a person or family can leave to future generations and offers landowners many advantages. Donating land is a relatively simple transaction. The Door County Land Trust often assists landowners in preparing and recording the necessary title work, arranging for surveying that may be needed, and helping the landowner reach decisions on important issues regarding the property. Have substantial real estate holdings and wish to reduce estate tax burdens. On a very select basis, DCLT purchases lands that are ecologically significant or possess outstanding scenic views. A bargain sale is a tool that can be a win/win for both you and the Land Trust. Here’s how it works: by selling your land to the Land Trust for less than its fair market value it offers several benefits to you: it provides cash, avoids some capital gains tax, and may entitle you to a charitable income tax deduction based on the difference between the land’s fair market value and its sale price to the Land Trust. This makes it more affordable for the Land Trust and it can be financially beneficial to you. Please fill out the “Landowner Inquiry Form” and staff will contact you to discuss your situation in more detail.